Serengeti National Park is undoubtedly the best wildlife sanctuary in the world, unequalled for its natural beauty and scientific value; it has the greatest concentration of plains game in Africa. The park is home to the greatest wildlife spectacle on earth - the great migration of wildebeest and zebra as well as the resident population of lion, cheetah, elephant, giraffe, and birds is impressive. The park covers 14,763 sq km. It is the Great Migration for which Serengeti is perhaps most famous for and the season is upon us as Tanzania’s wildlife experiences its phenomenon spectacle as million wildebeest and 200,000 zebras flow from the northern hills to the southern plains. So strong is the ancient instinct to move that no drought, gorge or crocodile infested river can hold them back. 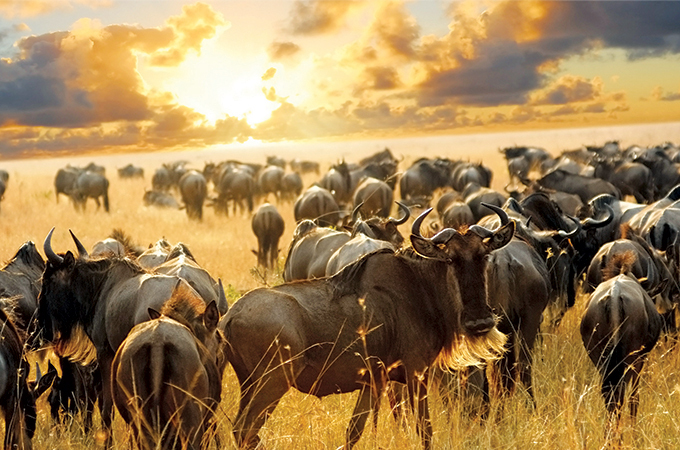 The Wildebeest travel through a variety of parks, reserves and protected areas and through a variety of habitat. Explore the different forms of vegetation and landscapes of the Serengeti and meet some of their most fascinating inhabitants.